I decided that I needed a "show-and-tell" robot since Twisty was a little fragile (mainly the line sensor mounting and shield) and hard to demonstrate without also having a line maze sample, which isn't especially portable. So, I designed a robot that could do things like follow a wall, avoid obstactles, and drive randomly around a table without falling off. Since her main thing is just wandering around, her name is Gypsy. The round holes are for mounting electronics boards and sensors. The rectangular holes with rounded corners are pass-throughs for wires. The "tabs" on the sides of the front panel fit into rectangular slots in the sides. The tabs at the top and bottom of the sides fit into corresponding slots on the top and bottom panels. The top and bottom are connected together with a couple of standoffs. The standoffs hold the top and bottom in place, they hold the sides, and the sides (and top) hold the front, so everything is held together with no need for glue. 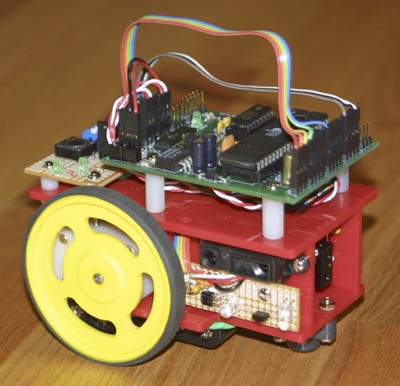 Here's a very quick description: Gypsy, like Twisty, uses the ARC 1.1 kit with an Atmel AVR ATMega16 processor. The caster in front is made by Tamiya; I've purchased them at Pololu and HobbyTown. The motors and wheels are from Solarbotics. Various sensors are from PARTS/Junun.